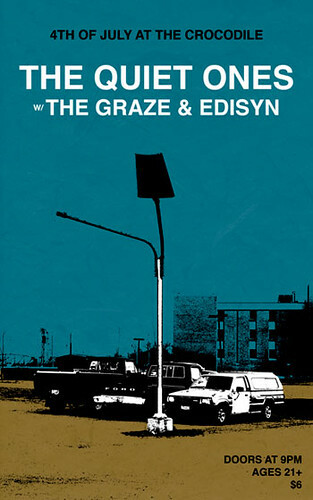 It’s been a long time but we’re having a full-band graze gig next week, on Tuesday, at the Crocodile Cafe. Tuesday is also the 4th of July, which means we’ll be competing against BBQs and fireworks and car alarms and drunks going “whooooo!!!!! U-S-A!!!! !” but just so you know, there will be time for those things and more before and after the show. Except the fireworks.. I’m pretty sure you’ll miss those. To make it worth your while, we should be debuting two songs to the band lineup. In other almost unrelated news, the debut Rosyvelt album is starting to see light at the end of a nearly two-year tunnel of basement recording time, which means that a. there will be a Rosyvelt CD to buy and love soon, and b. I’ll have more time to mic el grazo. So there you have it. News. See you next week!